When my husband and I decided to down-size to a townhouse, we also wanted to loosen up a bit. We didn’t want to be surrounded by the formal atmosphere that we had been living in for the past 15 years. Let’s face it. We’re empty-nesters. It was time to let go, hang out, get down, and all that other mumbo jumbo. However, we still had some formal furniture and rugs we had to live with. 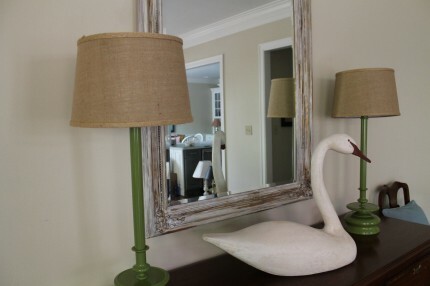 These were very high-end pieces that we just couldn’t toss aside, give away, or take to the consignment shop. I searched websites and magazines high and low and knew we could change our look considerably with just the use of accessories. Take our new dining room/area, for instance. 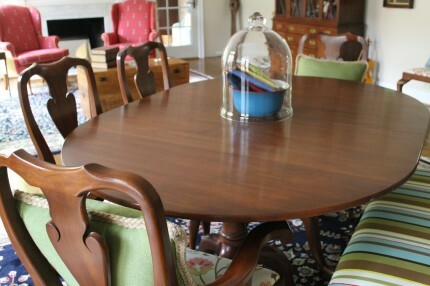 I reupholstered the chairs (seen here), bought a bench and gave it a new look (seen here), used a cute/casual centerpiece, painted a formal mirror to look abused and banged up, and brought in the vintage luggage. You can’t ever go wrong with old luggage. 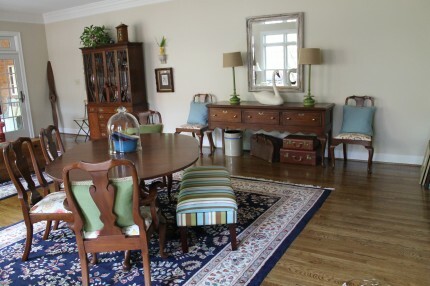 But first, here is a BEFORE shot of the dining room on the first day we looked at the property. Note that we removed the wall where the mirror is hanging. And here is our dining room today. The first thing I did was to not buy a chandelier and to use recessed lighting. I will pause as you all collectively gasp. I know that chandeliers are very popular, but I didn’t want to be married to always having the table in the same place. For instance, at the suggestion of my decorator friend Beth of The Lone Rearranger, it is now angled. 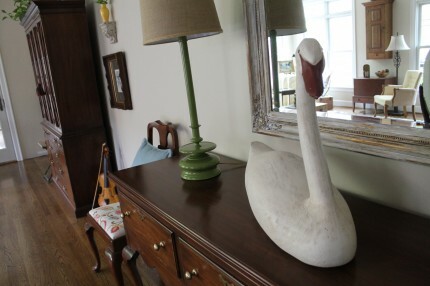 The formality of the side board is now softened with the addition of a carved wooden swan that I use seasonally. 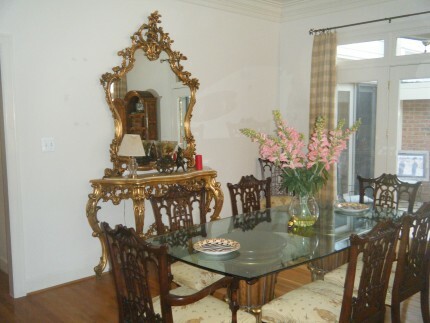 Two dining chairs in their new covers anchor it, and a formerly brassy/golden mirror hangs above it. 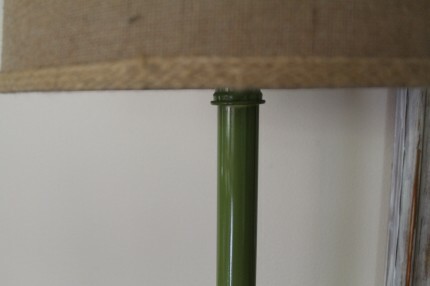 The two green lights with their burlap shades were brass with black shades in another life. They are temporary until an ebay purchase/project arrives. I’ll reveal it to you in the future. 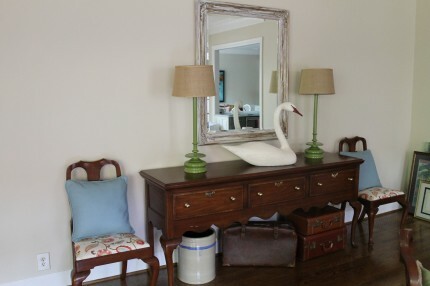 The pillows tossed on the chairs are seasonal, as is the swan. For fall I can pull out the greens, golds, and browns that are in the fabric. During the Christmas season, I can use red pillows to highlight the red in the fabric, and then we’ll go to yellows and greens for spring. The circle continues. 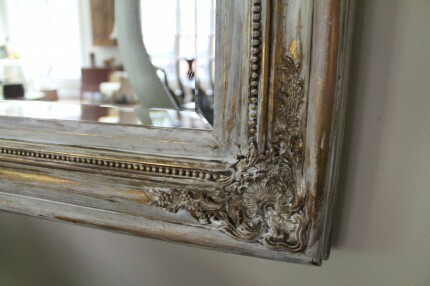 This mirror is directly opposite a set of French doors which give something nice to reflect. The china cabinet in the distance was in our last dining room. Now it is in the sitting area of the great room and is being used as a book cabinet. I will reveal that area in another post. This great room is bigger than our last dining room and family rooms, combined. 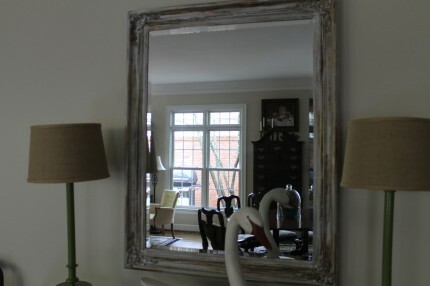 To get this aged look, I randomly sanded the mirror, painted it white, sanded some more, added some light blue, sanded some more and then applied two coats of Briwax with buffing in between. I love the way it looks. 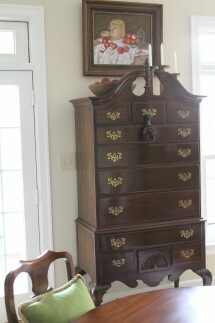 The high boy you see in the reflection sits on the wall opposite the side board. It is between the French doors and a nice large window. 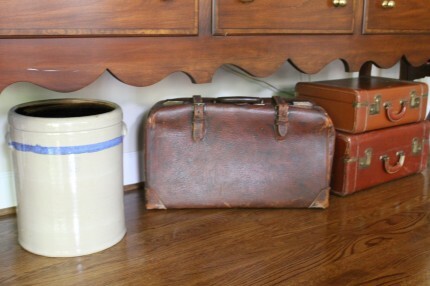 I placed the vintage luggage and old crock under the side board. 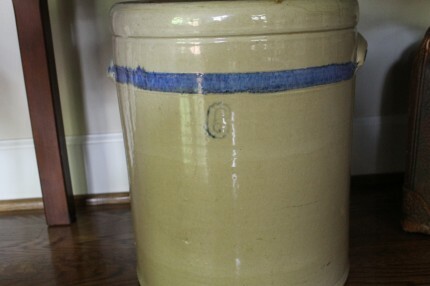 The crock has the number six on it because it will hold six gallons. The single suitcase belonged to my father, and I bought the other two pieces at an auction because they were engraved with my late father-in-law’s initials. 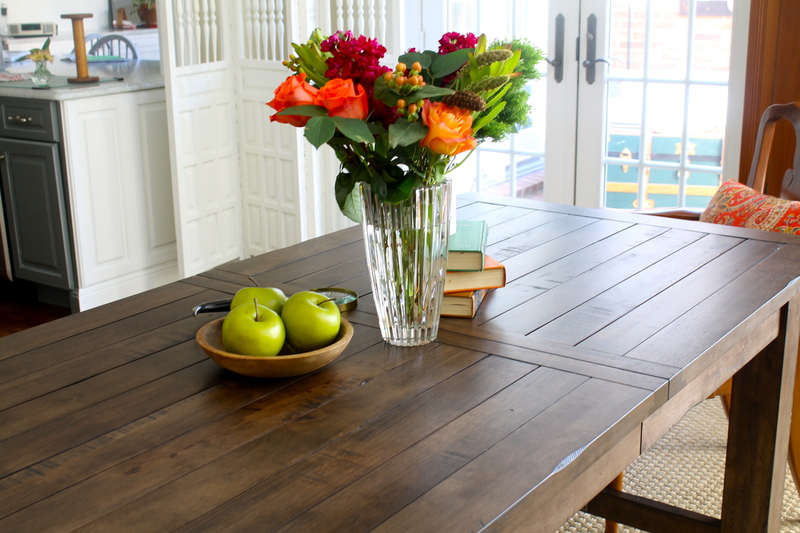 This view of the table highlights the angle. 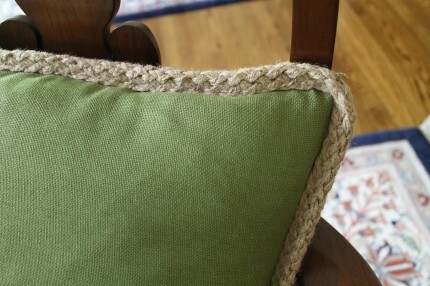 This pillow brings out the greens in the chair covers and matches the lamps perfectly. 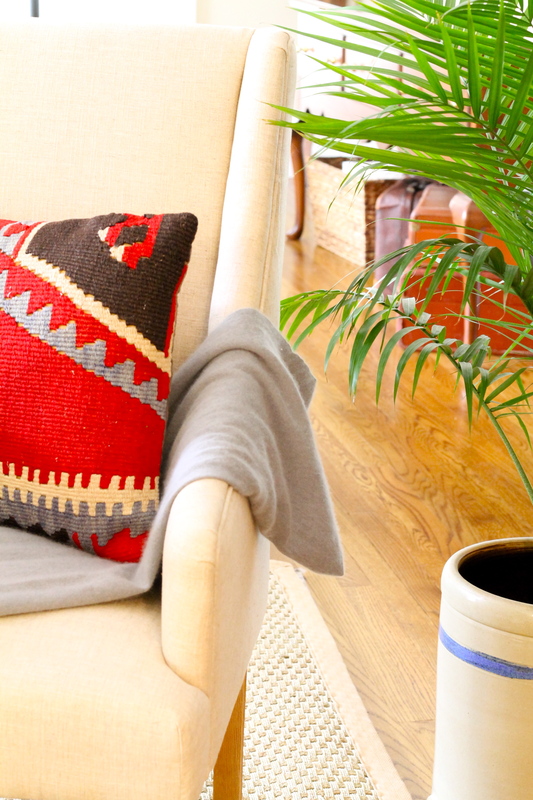 I bought all of these pillow covers from Pottery Barn last year. It looks as if I tried to match the pillow doesn’t it, but it was a total accident. 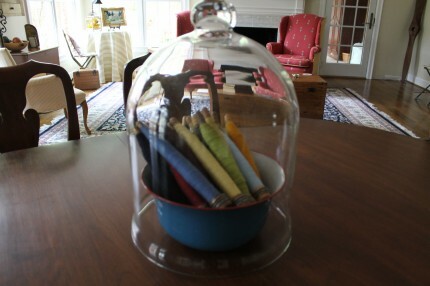 I love to display unusual things under our cloche. Here you can see them better. 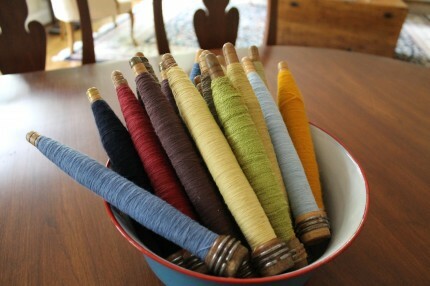 I bought these industrial thread and spools on ebay. They come in so many different colors and have lots of personality. I put the colors that I am trying to emphasize on top. For instance, right now, since it is summer, I am showing the pastel colors. 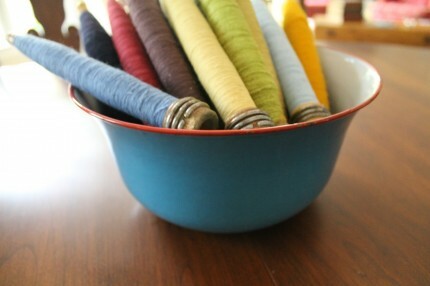 The enamelware bowl is from Sweden, and I bought it at the Brimfield Antique Show. See, it isn’t formal at all but works with the decor. The space between the French doors and the window provides the perfect area for the high boy. We accessorized above the high boy to make use of the tall ceilings. The oil painting was done by my mother. 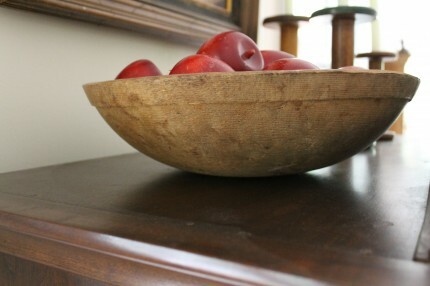 I happened to have some wooden apples and a wooden bowl that tie in nicely with the art. I placed some wooden spools topped with candles on the other side of the high boy. We are really pleased with the way it turned out. Loved seeing the changes you made. 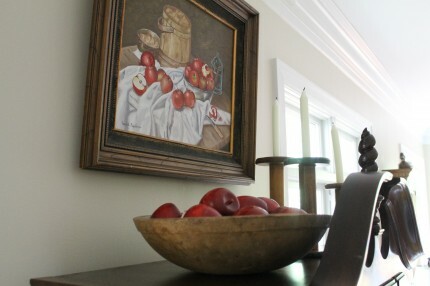 The oil painting is an eyecatcher! Love it. 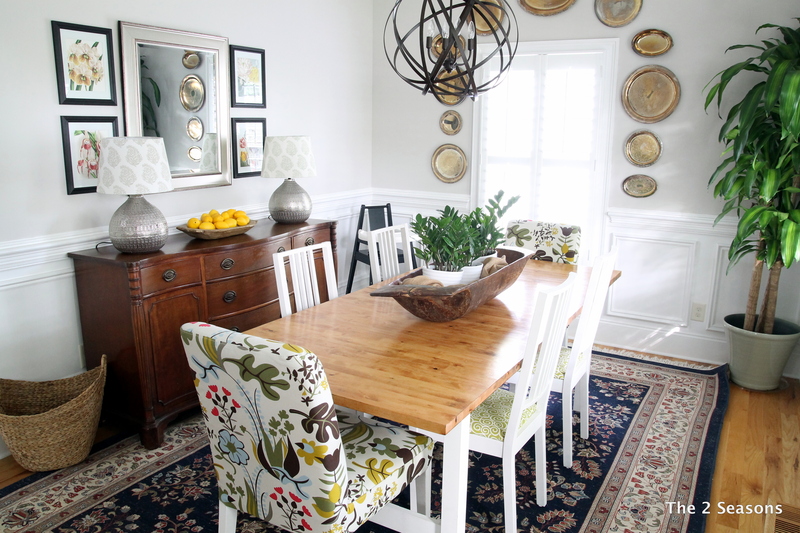 Your dining room is just so lovely! I really like the room you got after you took the wall down – you have so much space! 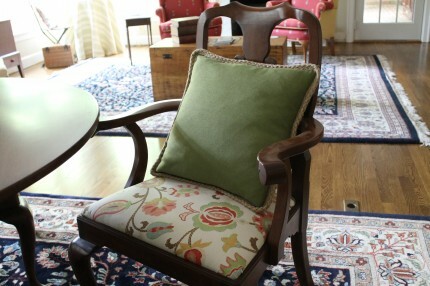 You have such beautiful furnishings and you did well on picking out the floral fabric – it goes with everything! 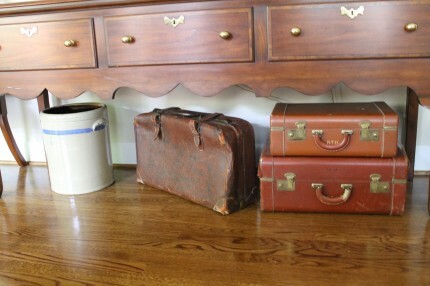 Janette, it looks so nice and I love the old suitcases under the sideboard. 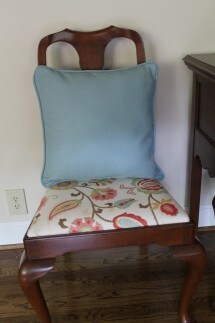 Love the colors and the chair fabric. I need to recover my chairs again. Tired of what I have. Love the finish on the mirror. Only thing I would do differently is paint one of the pieces of wood furniture in the room. Of course I want to paint everything lately and can’t. The room is beautiful just like it is and I can’t wait to see your ebay purchase. Thanks for joining the party. Your room looks very inviting. Great touches, I love the pops of color. I love the room Nice to see touches of painted items drawing the color across the room vs. then entire room full of painted furniture. I am tempted to paint more things like so many people seem to be doing. But I am afraid I would regret it later. The touches of color are nice.